Tripoli (AFP) – The airport serving the Libyan capital resumed flights on Saturday following a five-day suspension after deadly clashes around the facility that also damaged planes on the tarmac. 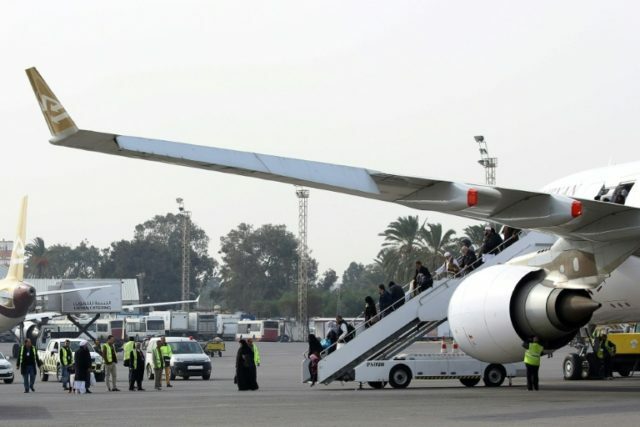 Lotfi Khalil, the director general of Mitiga airport on the eastern outskirts of Tripoli, said services resumed with Buraq Air flying to the eastern city of Tobruk and Libyan Airlines leaving for Tunis. One local carrier, state-owned Afriqiyah Airways, however, has yet to resume operations because its planes were damaged in Monday’s fighting in which at least 20 people were killed, he told AFP. Since the closure, flights had been diverted to Misrata, a city 200 kilometres (120 miles) east of the capital. Mitiga airport, a former military air base, was evacuated on Monday after militiamen attacked it in an attempt to free detainees at a jail there. The health ministry of Libya’s UN-backed Government of National Accord (GNA) said 20 people were killed and 63 wounded in the violence. The GNA condemned what it called a “premeditated” attack by gunmen trying to free “terrorists” belonging to the Islamic State jihadist group and Al-Qaeda. Mitiga has been a civilian airport since Tripoli’s main international airport was badly damaged in fighting between rival militias in mid-2014. Libya has been wracked by chaos since the 2011 uprising that toppled and killed long-time dictator Moamer Kadhafi, with rival authorities and militias battling for control of its oil riches.